PUR attitude shows it's true holiday spirit with a buy one PUR energizer Nano Solutions Skin Infuser,buy one get one free deal available starting Black Friday and ending the day after Cyber Monday 2018! The PUR energizer Nano Solutions Skin Infuser uses a waterless natural polymer system found in almost every cell of our bodies to hydrate the skin. By linking this system with Phospholipids, Ceramides and Sphingolipids, this one-of-a-kind technology enhances the absorption of key ingredients through the skin’s defense wall. Use of this device is will plump the skin to soften the look of wrinkles with cutting edge natural technology. Now that's a gift worth sharing with friends and loves ones get your buy one get one free deal here! I have been using the PUR Attitude line of products since last year at Christmas and have yet to be disappointed by any of their products! I am a mother of three with a fourth on the way. I hate pesky creams that are so thick you can not breathe in them. PUR Attitude is all natural, safe, healthy and effective! It makes the perfect gift this holiday season!In addition to their already amazing products PUR attitude just announced a buy one get one free special starting Black Friday and continueing until the day after Cyber Monday buy one Pur energizer Nano Soilutions Skin Infuser get one free! 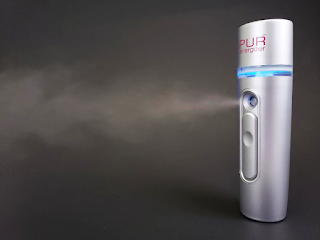 The beauty of the PUR attitude brand is that they can deliver such advanced technology using safe ingredients. The science behind anti-aging skincare is developing at a rapid rate. The products have better performance than ever before. Each product in the PUR attitude line is dermatologist tested and approved, backed by independent clinical studies, and follows the brand’s standards for “Safe Beauty,” avoiding harsh chemicals, parabens, PEG’s, glycols, sulfates, petro-chemicals, synthetic fragrances and artificial dyes.